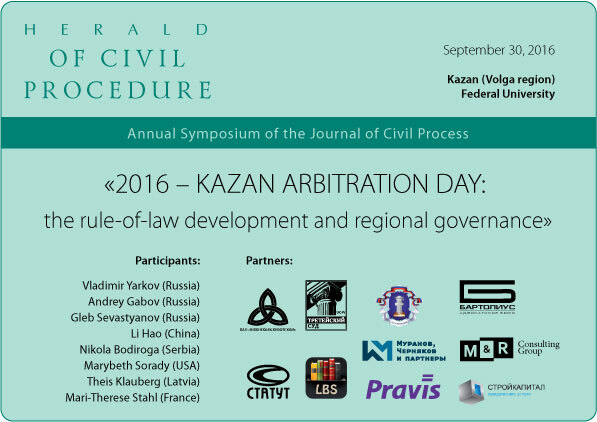 We invite you to participate at the III Annual Symposium of the Journal «Herald of Сivil Procedure»: «2016 – Kazan Arbitration Day: the rule-of-law development and regional governance», which will take place on the base of Law faculty of Kazan (Volga region) Federal University, September 30, 2016. The symposium will be attended by leading Russian and foreign experts in the field of arbitration; in particular, participants are expected from the USA, China, Serbia, Finland, Turkey and Lithuania. - a new arbitration in Helsinki. The Symposium will take place on September 30, at Kazan Federal University (Russia, Kazan, Kremlevskaya Street, 18, main building of university, Law faculty). Registration of participants of the symposium is accomplished by sending an application in a free form with indication of the report topic (in the case of speech), plus contact information till September 1, 2016. Travel and accommodation expences are paid by participants. Symposium organizers can assist you with booking hotels.